Finally finished and printed the edition of 15 wood engravings for this year’s Print Zero exchange. Just need to give them a few days to dry, then they’ll be ready to trim, number, title, sign and pack up ready for dispatch to Seattle. are lots of fun. I’ve just received a call for entries to the 6th print exchange run by Print Zero Studios in Seattle. What is a print exchange? Briefly, printmakers from all over the world submit an edition of prints (in this case, 15) to whoever is organising it. Two of the 15 are kept for exhibition and archive purposes and the other 13 are randomly dispatched to other printmakers who took part. This means that everyone submitting gets back a portfolio of 13 different prints by 13 different artists. Plus, you get your work exhibited in other countries; for instance the last Print Zero exchange showed in seven venues across the US and in Denmark. The cardcut on the left was my submission. I also submitted for the first time this year to another exchange run by Oregon Ink Spot. Deadline was yesterday so it’ll be interesting to see what comes my way over the next few weeks. Portraiture is my thing. Most of my prints have people in them, usually in a portraity way, so I thought I’d continue along those lines for my initial wood engravings. The ones I’ve made so far seem rather too ‘white line-ish’; not something I’m hugely keen on. Hence my next experiment which was an attempt to achieve a more ‘black line’ appearance. Having drawn the image on the block, I cut both sides of the lines to leave a black line in the middle. At this stage, I proofed it to see what the lines would look like (see right); an interesting image itself. What a good day I had yesterday. After five long months intaglioless, I finally got a chance to get thoroughly inky again. 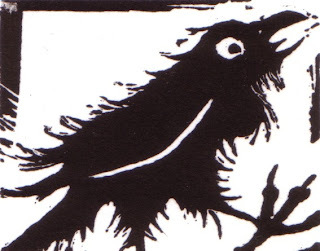 There’s nothing so satisfying as being able to look at one’s blackened fingernails and ink-stained skin, knowing that there’s a batch of freshly pulled prints – good ones at that – flattened under boards to dry. I really didn’t expect to pull so many good ones yesterday. Five months is a long time to be away from one’s work. Prior to that, I was printing and etching every other week and working on the plates in between. Working that intensively, you become familiar with all the little nuances of the plates; you know exactly how much ink to use, which areas need a little more or a little less; how to wipe, where to wipe vigorously, where to wipe gently. As you pull each proof, you study it and notice all its subtleties, making decisions almost subconsciously as you go along. It sounds poncey I know, and I like to think I’m not pretentious but I think it’s true to say that you work with the plate rather than on it. That’s what’s so wonderful about etching – you’re never quite sure what you’re going to get. You have an idea how it’ll look when you pull that first proof, but there’s always an element of surprise. The plate, the ground and the etching solution all conspire to give you something you didn’t quite expect. It may not always be a good surprise of course, but that keeps you from complacency. Here are my first experiments. Odd how, even though the marks are quite dense in places, still, the overall impression is one of dramatic lighting. Maybe not so much with the stippling. That looks quite stylised actually. I’m not particularly happy with these but there are elements of both that I like; the eye in the first image and the nose in the second. They both look better if you squint… Lots more practice needed! Partly for me to record my progress learning a new technique and partly as a place for me to reflect on my art practice. I would say that 80% of the creative process for me goes on in my head. I tend to mull over ideas for weeks before actually putting anything on paper, card, zinc or wood; presumably this can be said for most artists to some extent. I do make a few notes in my sketchbook but they’re minimal. The first thing I discovered about wood engraving was that it’s by no means as easy as it looks! Much more difficult than linocutting, not just because the matrix is harder, but because one is working on a much smaller scale. I very much admire the work of engravers such as Hilary Paynter and Jim Westergard and I suppose in my ignorance, I was aiming for that kind of neatness and detail straight away. Think again Jo. Obviously, to produce that kind of work takes years of practice and an innate talent that no amount of hard work can produce. So, here on this blog, you can see my humble, clumsy but well-intentioned beginnings. I started off with a box of practice blocks; hence the odd shapes of some of my initial prints. I quite like that actually – gives another dimension to the work. Certainly I think it worked with Comedy and Tragedy (below in previous post). 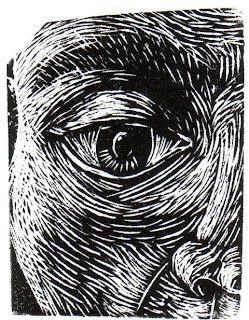 Wood engraving (as any method of relief printmaking) produces very different results to etching. I’ve had to reorder my way of thinking about an image; instead of working from light to dark as one does with etching, drawing the darks onto the plate, I now have to work from dark to light, cutting out the lights from the dark of the block – if that makes sense. Also, the whole process of creating tone and texture is very different. The possibilities are endless with etching – with wood engraving, there seem to be many more constraints. And yet, look at Hilary Paynter’s Goblin Market or Jim Westergard’s The Artist as a Viking and you see that it can be done. First task then is to experiment with different mark-making techniques. 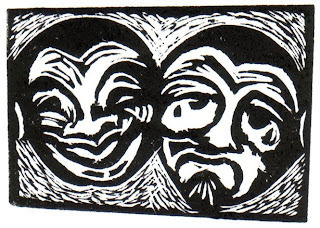 It’s been a fair few years since I did any relief printmaking; linocuts of course. These I did after I left art school and no longer had access to an etching press. As the subtlety and variation of marks, tones and textures of etching were what drew me to printmaking in the first place, and really suited my work, I found lino a bit frustrating. I know many artists are able to bring a delicacy and textural quality to this medium, but I just couldn’t. What I produced was so flat and chunky – and downright clumsy – that it just didn’t grab me at all. There followed an eight year hiatus during which I just drew a little and made the odd linocut. Luckily for me and my frustrated inner printmaker, an open access printmaking workshop opened up just down the road from me - and I was away! What's that all about? I'm an intaglio printmaker by default; etching, drypoint and cardcuts. Personal circumstances, those annoying things that get in the way of one doing what one really wants to do, have all but wrenched the etching needle out of my inky hand and taken away the copper sulphate bath. After a period of vowing never to print again, here I am, spitsticker in hand, discovering the wonders of end grain boxwood, lemon, pear and maple. Mostly maple because I'm not rich or very good. However, I am hopelessly hooked.